Only a few days now until the Easter break, so it is the perfect time to make some homemade Easter gifts for family and friends. 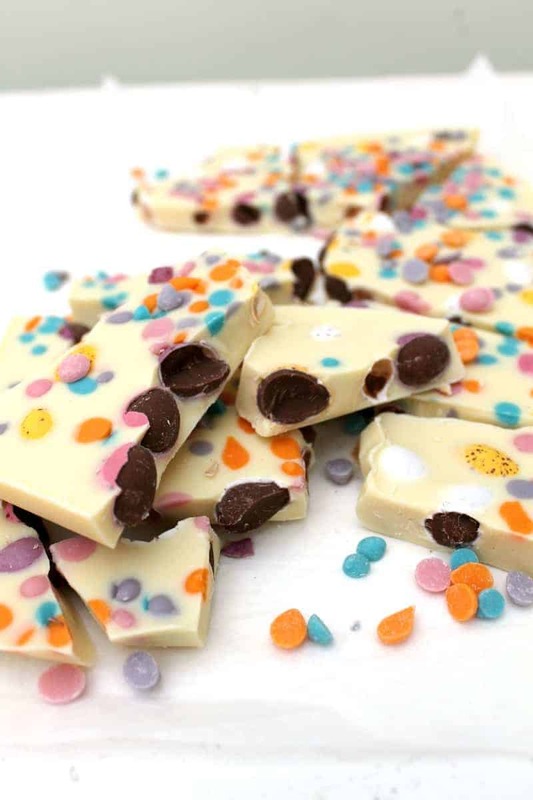 This mini egg white chocolate bark is great as it is so easy to make (just melting required!) and you can change it up however you like. I love Mini Eggs with their crunchy shells, and in this chocolate bark they add a great crunch to the chocolate. On top I’ve decorated the bark with unicorn chocolate chips as I just loved their colours and thought they really set this off. You can just pick all the ingredients up at the supermarket so why not give out homemade gifts the year instead of pre-packaged Easter eggs! 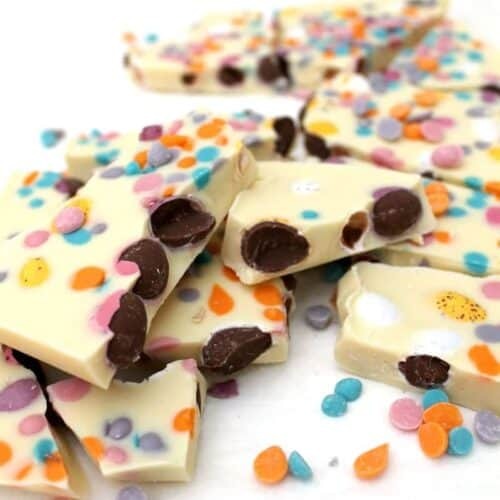 If you think you need hours to spare to make Easter gifts, you really don’t for this mini egg white chocolate bark. 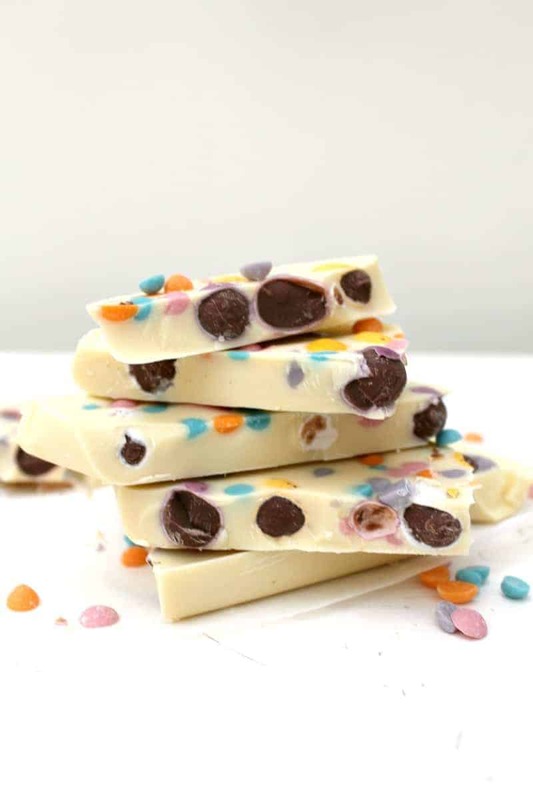 All you need to do is melt down some white chocolate, then get your Mini eggs and multi-coloured chocolate chips ready, and that’s about it! I use the microwave to melt my chocolate down, white chocolate melts a bit quicker than milk or dark I find, so this only took 1 minute on a low heat in the microwave for me. Then have a small lined baking tray to hand – I used a small brownie tin. All that is left to do is to pour the white chocolate in, drop in two packs of Mini Eggs, and sprinkle over the unicorn choc chips to make it look pretty. Then transfer to the fridge carefully, place it on a flat surface, and chill until set. This took around two hours in my fridge. Once set, break into shards and if using it for gifts, package in Easter themed packaging. Kids love to make and eat this Easter treat, and it makes a lovely change from an Easter egg. 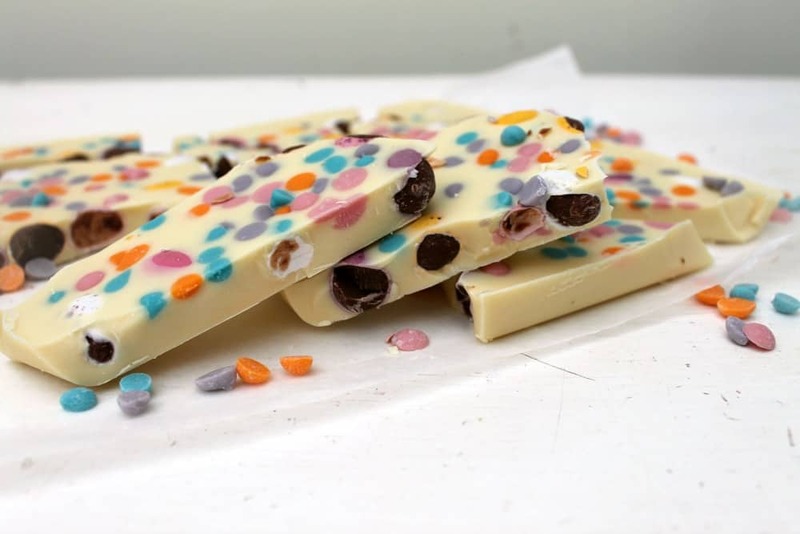 The Mini Eggs sink into the chocolate and are revealed when you break into the chocolate bark. If you prefer you can also cut the bark into squares instead of breaking it up, I like it both ways but the shards seem to be a bit more fun. 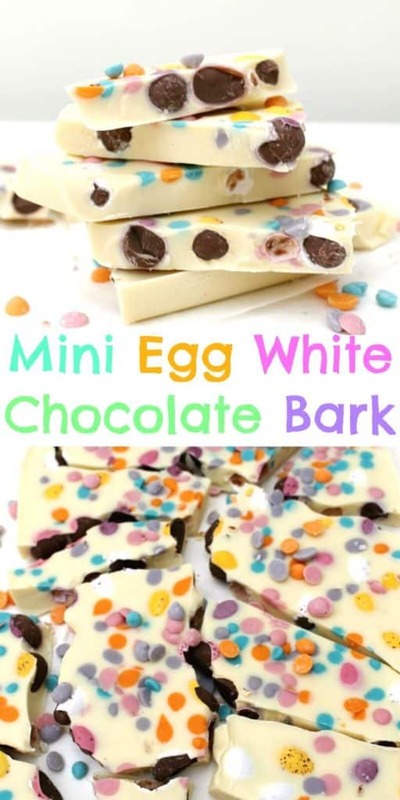 An easy to make Easter treat which is great for giving as homemade gifts, kids will love to help make and eat this mini egg chocolate bark too! Melt the chocolate in a large bowl in the microwave at a low heat. Start off with 1 minute then check. In my microwave it was melted after 1 minute and just needed stirring to melt a few remaining lumps. Line a small tin with baking paper. Pour the white chocolate into the tin. Add the Mini eggs then sprinkle over the unicorn chocolate chips. Transfer the tray carefully to the fridge and chill for approx. 2 hours until set. Break or cut into pieces and serve. How lovely the idea is!